Learning Redikall healing was one of the greatest gift I have ever received in my life. Learning Redikall healing was one of the greatest gift I have ever received in my life. Moreover, learning it through Suneeta Ma’am and Varsha Ma’am was really an enriching experience. They made this healing technique come to life with their personal involvement and love. The way they explained various chakras and what they stood for using gestures, actions and phrases still stays with me and adds to a higher recall value of those chakras and their meanings. A million thanks to both of you for connecting to our hearts and making teaching a beautiful by-product. 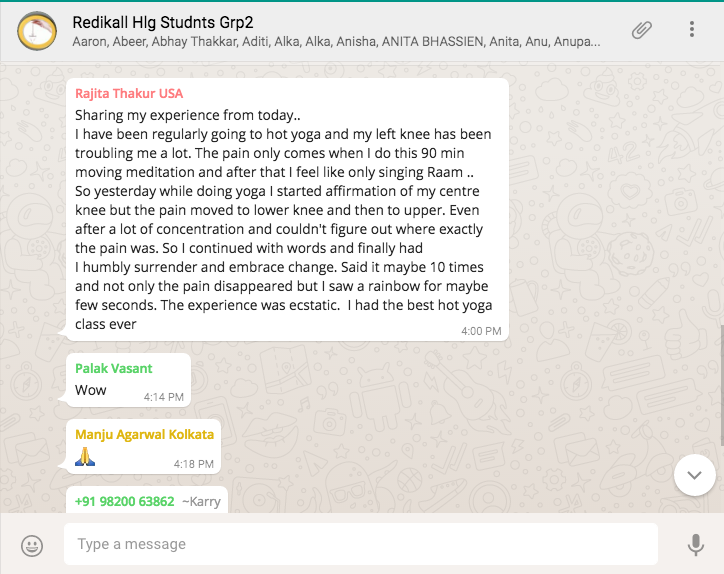 Redikall has helped me a lot in both my personal and professional life. I got over my hair fall issue when I was a demo for Suneeta Ma’am in our class. Forever indebted to her for this. 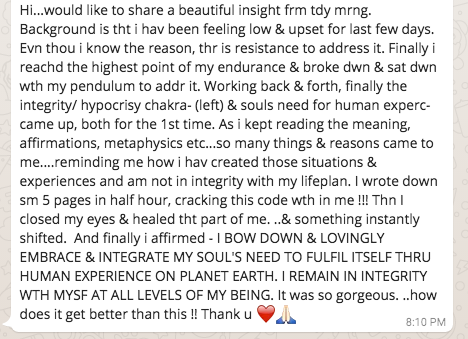 Not only did my issue was resolved, I understood a far greater truth and got a direction in my life - to listen to my inner voice. Whenever I feel I need to understand my issues, I do a Redikall for myself and it really helps me find a perspective. I have done Redikall healing for many of my clients. I would like to share two of my startling cases. One of my clients got over his problem of daily vomiting and his confidence really increased with the help of Redikall affirmations. Another of my clients came to me with his business issue. After practicing the affirmations for 11 days, he came to know that one of his partners was involved in misdirecting the company’s funds. That person accepted what had happened and the funds in question were restored. Redikall amuses me every time I put this brilliant energy system healing to work. It completes my repertoire of healing techniques and therapies and makes it holistic in nature as it works on many different levels. 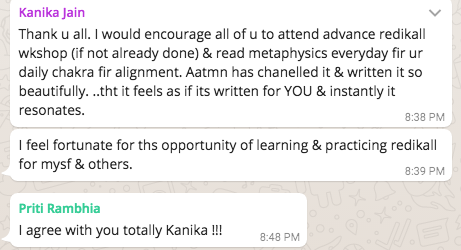 Thank you Aatmn for this blessed knowledge and I am grateful to my teachers, Suneeta Ma’am and Varsha Ma’am for putting their heart and soul into teaching us this powerful modality. At the onset, I was not very optimistic about its benefits for me. I felt how can I learn this course within two days? But after having attended this course/workshop I really feel that I have a solution to all any of my problems & also I feel empowered & confident that I can also solves other’s issues. I used to remain very upset due to my thoughts towards my family but after attending this workshop, I completely changed my opinion & u know what I feel - like I am a free bird, I can speak, I can fly ,I can think in very correct way etc. So, in short I love this course. I completely enjoyed myself. I was having so many wrong beliefs about myself but now I have understood the ways in which I was wrong. So, actually what I was needed self-recognition & finally through this workshop I got it. Note: - I completely agree about the part about my identity. I accept my identity totally & completely. Actually I was going through various shades of life believing that it was my destiny .But this course changed my thoughts & due to this knowledge & change of my life cycle, I have found the best solutions - to lead my life, to overcome my problems, to get a good and a smooth life. I am very thankful to you for guiding me on this. I had a constant nose block and cold for seven years. I tried to work on my cold through allopathy, homeopathy and also auyrveda but no matter what the cold would just not go. When I got my charka checked I realized that I had a huge block in my throat charka. I lacked confidence in myself which hampered my communication. Working on this charka made a big difference in my life. My cold vanished in just a couple of days. Not only that but I had a fear of driving before which for some reason was not there and in a matter of couple of weeks I was driving a car confidently all around the city. I feel great about my self now. Thank you for choosing to learn Redikall. We look forward to your feedback and testimonials. Feel free to rate the training program and if you wish to contact us, leave the request. We will certainly revert, provided, you have mentioned your contact details.